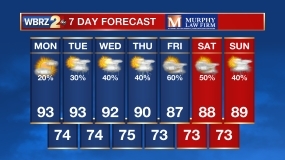 After one more nice day, rain returns to the forecast. As can be expected in the spring months, yet another chance for severe thunderstorms is in the cards. Today and Tonight: A second consecutive nice afternoon is ahead as sunshine carries thermometers into the mid 70s. Some high clouds may be noticed, especially late. Winds will be lighter and out of the east. Clouds will begin to increase overnight and temperatures will not be nearly as chilly. Expect lows in the mid to upper 50s. Up Next: A warm front lifting through the area will create scattered showers on Friday, but a washout is not expected. The trailing cold front could be another troublemaker Friday night into Saturday morning. Depending on the development and track of a surface low along the cold front, there could be a more favorable setup for severe thunderstorms. Beyond the front, much cooler temperatures will spill into the region and after a pre-frontal high temperature near 70 degrees, much of Saturday afternoon will be spent in the 50s and 60s. Another spring chill is in store for Sunday morning with a relative lull in precipitation chances before the next front comes by early next week. The next 500mb trough will begin to dig into the Eastern U.S. on Friday. Initially, a warm front will push through the area setting off scattered showers and a few thunderstorms. The trailing cold front will push through on Saturday morning and will bring another threat for severe weather. A wave of low pressure along the front may pass right across Louisiana, creating a low-level wind profile that is favorable for all modes of severe weather. Surface temperatures and dew points will be back into the warm and muggy category but upper level thermal profiles will stay cool due to the advancing trough. This will create additional instability, which also supports a better chance of strong thunderstorms. With no trigger besides the front development may be limited away from the boundary keeping most of the activity linear. In this scenario, damaging wind gusts would be the primary threat with the possibility of hail and an isolated tornado embedded in the squall line. It is still too early to categorize these threats but worth mentioning that they are on the table. Analog forecast favor severe storms in this type of scenario to be just north of the local area, but only minor track shifts could result in a greater risk. 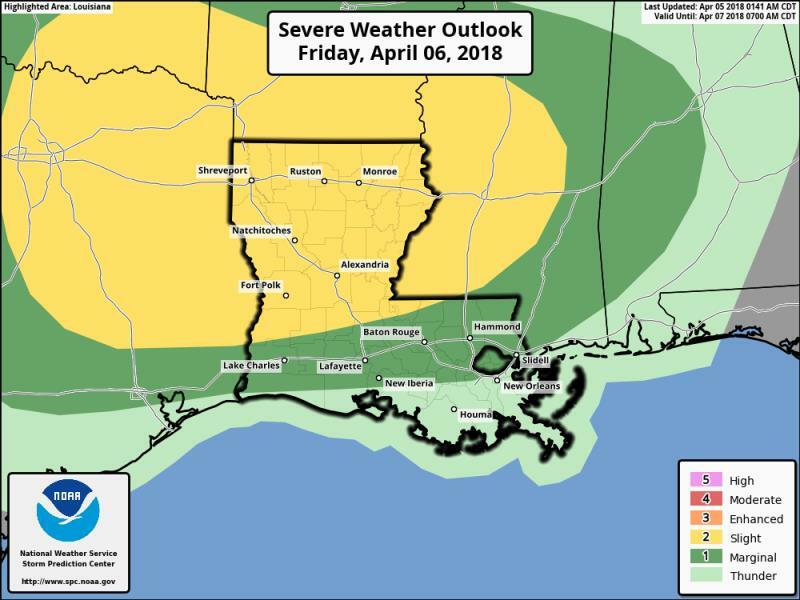 The Storm Prediction Center has placed the northwestern corner of the forecast area under a “slight risk” for severe weather with neighboring areas south to I-10 under a “marginal risk” through Saturday morning. The cold front will push through the area on Saturday morning and clouds are expected to be a bit more stubborn to exit. Northerly winds will transport chilly air into the region and temperatures will fall into the 50s, not recovering much in the afternoon. Once again, 40s will be possible on Sunday morning. Another warm front will quickly lift through the area late Sunday and for this reason considerable cloud cover and even spotty showers will be mentioned on Sunday. The next trough will pass farther north of the area on Monday sending another front through the region. Rain chances are carried in the forecast, but that is still a bit far out for additional details to be mentioned with any confidence. As that front exits, a longer period of quiet weather is in store as temperatures moderate during the middle and end of next week.